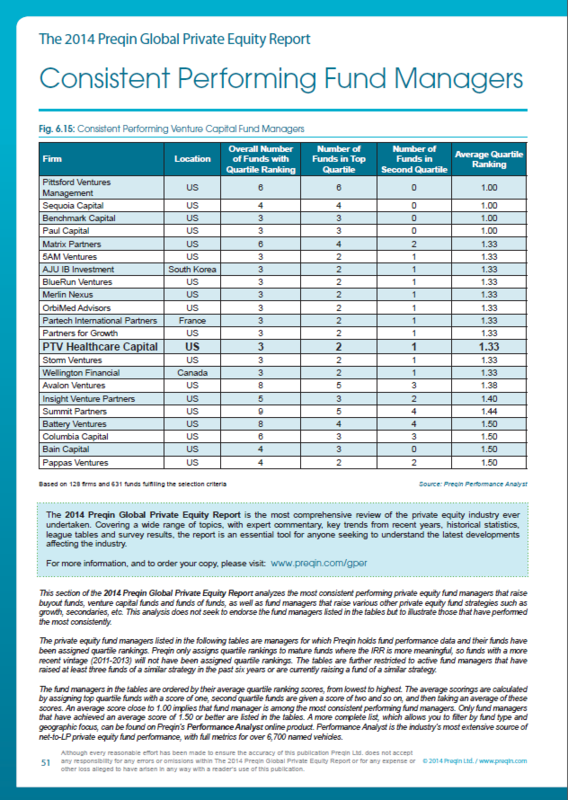 Austin, Texas – February 28, 2014 – PTV Sciences (“PTV”), a healthcare venture capital firm, announced today that PTV has been listed in Preqin’s 2014 Global Private Equity Report as a Consistent Performing Venture Capital Fund Manager. The Preqin Global Private Equity Report is the most comprehensive review of the private equity industry undertaken, utilized by thousands of industry professionals every year to access statistics, analysis, trends, league tables, and commentary. To determine the most consistent performing private equity fund managers, Preqin assigned quartile rankings to active fund managers that have raised at least three funds of a similar strategy in the past six years or are currently raising a fund of a similar strategy. Fund managers were then ordered by their average quartile ranking scores, with an average score close to 1.0 implying that a fund manager is among the most consistent performing fund managers. Of the 128 firms and 631 funds fulfilling the selection criteria, PTV was one of only 22 fund managers to make the list, with an average quartile ranking of 1.33. Only four firms received a higher ranking. Consistent fund performance across a series of funds is of great importance for long-term private equity investors. Preqin’s analysis has shown that the majority of fund managers with top-quartile funds go on to produce returns in their later series of funds that also beat the median benchmarks. PTV is a healthcare venture capital firm dedicated to enabling healthcare entrepreneurs and global innovation. It is comprised of a highly collaborative team of 29 professionals, deeply experienced as investors and operators of life science companies. PTV’s focus on mid-to-late stage companies with comparatively low technical, regulatory, and financial risk positions them as being with the grain of healthcare reform and poised to leverage change across the healthcare landscape.